I had been planning the Rat ride for sometime back during the winter, but I didn't expect it to be as nice as it was (or, at least, initially). You see, two weeks previous to the RAT ride, I arrived home from work on my 2002 Concours with 100,000+ miles thinking this bike would have to take me another year or two. And, up until that time, I was completely happy with my current ride. Upon arriving home and raising my garage door, I found a brand new 2006 BMW Advenuture surrounded by my friends and family including Dan Christie (my cousin). You see, Dan Christie had ordered this new bike for me back in November and he had been waiting till the end of April to give it to me. This was a gift from Dan. That makes me a very lucky person. Dan has been riding with me off and on for years including my first ride when I was very young. Dan had ridden a Honda Scrambler to our house in the country and loaded up all three of my brothers and I at the same time to ride up the rock road. Barry and I rode on the gas Tank and Chris and Tim rode on the seat behind Dan. Pretty exciting for a young kid, but a nightmare for a mom. 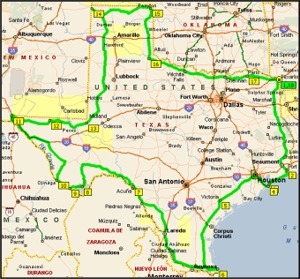 I've ridden with Dan numerous times in the past 20 years to include: Branson, MO, Ouray, CO, South Padre Island, TX, Big Bend, TX, Ruidoso, NM, Hill Country, TX, etc. etc. One week previous to the RAT ride, Dan passed away unexpectedly and caught us all be surprise. That sure left me with a very heavy heart, and I wasn't planning on making the RAT at that time. I had tried to ride some that same weekend, but it was difficult. I soon discovered that they weren't having Dan's memorial till the next Saturday. I decided to continue on my ride starting Tuesday morning and that would put me back in Prosper in time for the Memorial. Dan was fond of riding and I know he would have wanted me to ride. I left work Monday afternoon at 3 pm so I could make the check-in at 6 pm in Texarkana. Everything went fine on the trip to MTF headquarters and I had a short while to visit with some old friends before going to bed. 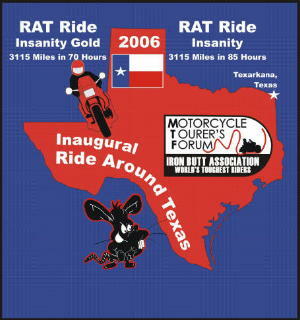 (If you want more information on the RAT ride, just click on the logo above and it will take you to the MTF link.) I set the alarm for 4:30 am, but I was up and ready by 2:30. By the time I got myself saddled-up and at the initial fuel stop it was 3. I was off to a great start with only a slight intermission with the Jefferson Police Department. My first chance to run across some fellow riders was on the ferry between Port Bolivar and Galveston. It was also a good time to re-organize, eat, drink and plan the continuation. After departing the ferry, we all went separate directions. I chose to go back toward Houston, then cross the new turnpike toward Hwy 59 that took me south to Victoria. I guess the others chose another route. My route worked well for me. I would see the occasional bike along the way until I got to South Padre Island. Because we have to backtrack some of the route, I saw numerous bikes on the same trail as myself. There are approx. 60 bikes on the same ride, but you don't see each other much until you have to stop or backtrack some of the route. My first night ended in Del Rio at midnight with approx. 1200 miles for the day. I had seen some deer, but not too many. I stayed in my favorite motel in Del Rio and was up and going by 4:30. The deer became much more plentiful on the stretch from Del Rio to Marathon, however it was starting to get light and was becoming more enjoyable. I stopped at a required border patrol checkpoint and they advised me of 4 or 5 fellow scooter riders that were ahead of me several hours. He said I was running late. Regardless of the hard day's ride behind me and ahead of me, I was pumped. I pulled into the Panther Junction mandatory gas stop in Big Bend and fueled up my steed. Upon returning from the bathroom my bike wouldn't start. Hmmmm, I must have done something wrong (not uncommon). I double checked all my switches and continued to try. As bikes came and went, I continued to try. The gas station attendent handed me a phone number of a local guy who helps stranded bikers from time-to-time, but I wanted to give BMW the first opportunity. After 5 hours of advice from various sources including BMW, I decided to call Ralph Delmar. Ralph was very helpful although he didn't give me much hope for returning to my RAT ride. Late that afternoon, he diagnosed my ride as having a dead-short in the fuel pump. We assumed we would have to order a new part in order to get back on the road. Ralph loaned me a 650 to ride down the road to a motel to stay the night. I was fortunate to get to stay in the very same motel that I stayed with Dan (and several other scooter riders) in, many years previous.The next morning I was up and learning my way around town while doing my laundry. Because I had assumed that I wouldn't be leaving town that day, I checked into the local library to get a membership and use the internet. While at the computer, Ralph called and said he had the fuel pump working and I needed to come back to the shop. Upon my return to the shop, Ralph said he had "thumped" the fuel pump and got it to working. I'm not sure how that works, but I was soon thinking about the time remaining on the 85-hour certificate. I basically had 28 hours to run 1700 miles. 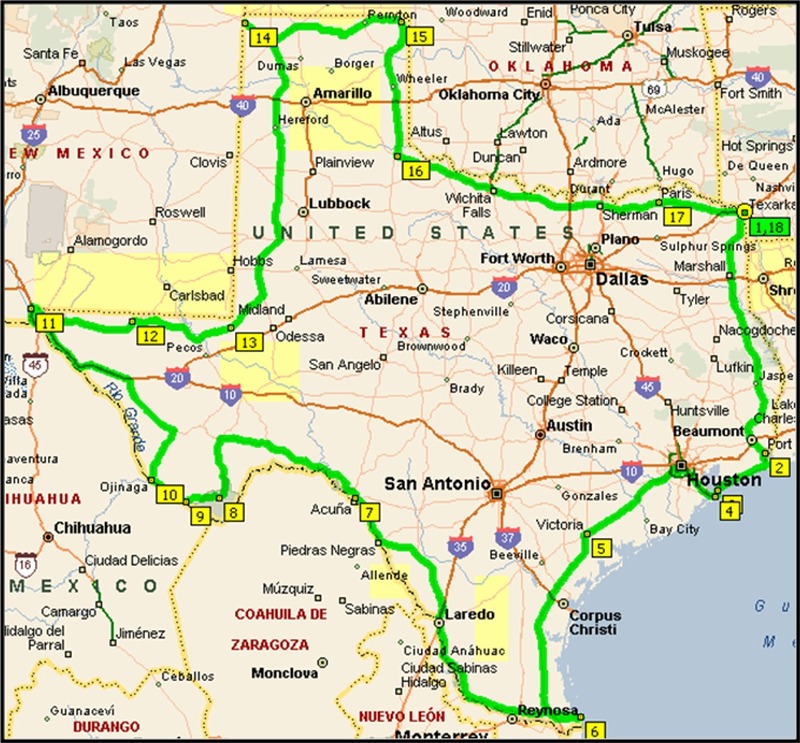 That would have been easy enough on an interstate highway, but I had very little interstate, but mostly state highways, rural towns, deer, and nighttime. If I was to run straight through non-stop, then I would have a chance at my certificate. I already had friends at home that was willing to come pick me up in case I had a breakdown, so I asked Ralph to put it back together so I could get on my way. By 11:30 am I was on my way. Nothing much left to do but ride ride ride, and I did just that. I had a brief scare at the Guadalupe Mountains when my bike wouldn't start for a couple of minutes. Next to that, my biggest scare was a deer running full speed across the road between Guadalupe Mtns and Kermit. He could have hurt me very bad even if I would have been parked. He was running wild. I was lucky enough not to have any encounters with moving deer. In fact, all the other deer were grazing or bedded down next to the road. The rest of the trip went uneventful, but I was having a blast the whole time. I arrived back in Texarkana with an extra hour to spare. Texas is a wonderful state with more diversity than you can imagine. I recommend the trip.